Pymapper 9.6 is now available! Click here to go to the downloads page to get it. 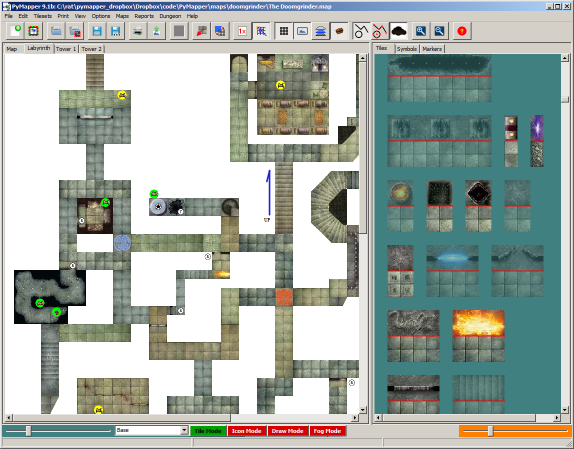 Pymapper is a map making utility used for role-playing games. The tile images are provided by the user and can be any jpg or png format image. Finished maps can be printed scaled down or full size for easy use in your gaming sessions. There is also game support for the Paizo Pathfinder and Dungeons & Dragons 3.5 and 5th Edition rulesets. A fog-of-war option is also available for those of you lucky enough to have a projector or other dual screen system. Pymapper is actively developed in the python computer language, and the source code is available for download, as well as windows executables.